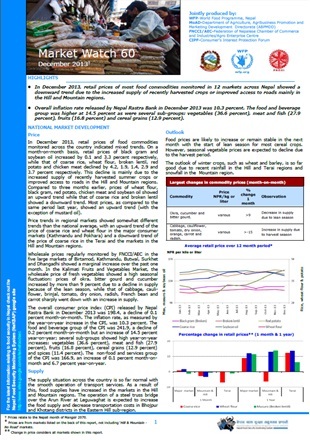 In December 2013, retail prices of most food commodities monitored in 12 markets across Nepal showed a downward trend due to the increased supply of recently harvested crops or improved access to roads mainly in the Hill and Mountain regions. 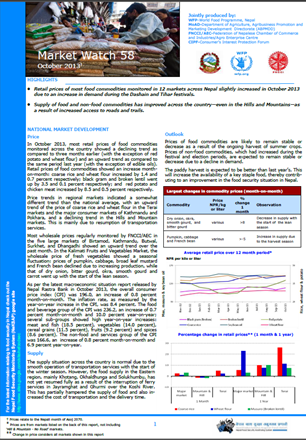 In November 2013, retail prices of most food commodities monitored across Nepal showed an increase month-onmonth,although there was a seasonal price decline for coarse rice. Supply of food and non-food commodities isnormal due to the smooth operation of transport services and improved access to fair weather roads and trails. 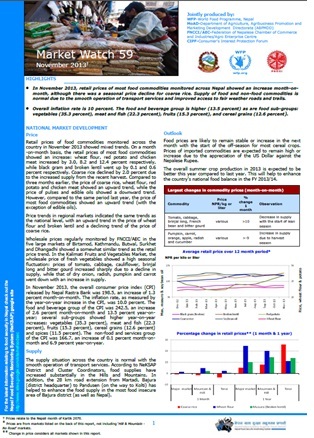 Retail prices of most food commodities monitored in 12 markets across Nepal slightly increased in October 2013 due to an increase in demand during the Dashain and Tihar festivals.